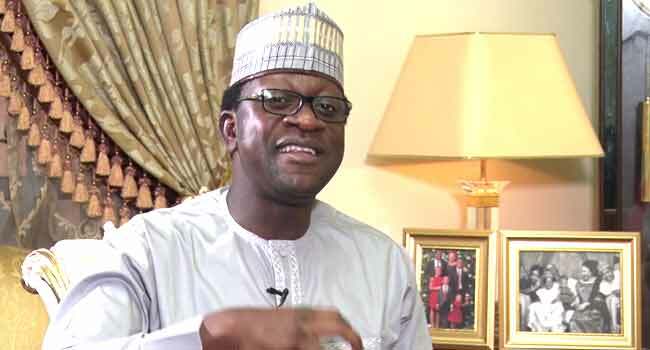 In this exclusive interview, a member of the House of Representatives from Kano State and former House Committee Chairman on Appropriation, Abdulmumin Jibrin, speaks to Channels Television’s Ladi Akeredolu-Ale about the forthcoming general elections and the crisis in the All Progressives Congress (APC) among other issues. Do you agree with the APC National Chairman when he said ‘all these people who are defecting, they are either machinery, they have very little electoral value, or that they were not fully in the APC anyway and, therefore, they won’t be missed’? I will not say they do not have either electoral value or political value. There are two values of politics; you have somebody who has electoral value – somebody like President Muhammadu Buhari, and you can also have those who have political value, somebody who has the capacity to mobilise people, reach out, network, mobilise resources, reach out to the media, and the rest. So, everybody in politics has his own value. I don’t want to particularly say they do not have value, but the point that I have made consistently, and I will continue to make, and I know that by the grace of God that is what will turn out to be the reality is that whatever value they carry, whatever value they have, whether political value or electoral value, it’s not going to affect the chances of Mr President and the chances of APC in the next coming election. President Muhammadu Buhari will win the 2019 presidential election. If we take the anti-corruption fight, there have been some notable milestones but there are those who are saying it has also been used as a tool of political witch-hunt. What’s your view? I don’t have any doubt at the back of my mind and even in this interview, I’ve said it repeatedly that President Muhammadu Buhari is going to win the election in 2019. It’s going to be a tough election, and it is good for our democracy. When I have conversations with some of my colleagues, I used to tell them that I even want the election to be very tight; when you go to Europe and America, that is what you see. You see a margin of one per cent, two per cent victory. The system in itself ultimately is a beneficiary of that kind of tight democracy. It makes the opposition strong, it puts everybody on his toes, increases the value of every member of the society. But when you have that kind of large margin of victory, it makes even the ruling party too relaxed. Secondly, my conviction that Buhari is going to win the next election, you can categorise it into two aspects. There is a political consideration and, of course, the aspect of governance – that is where it deals with the various things that he achieved, particularly in these three aspects of security, economy, and anti-corruption; but first let’s take the political aspect. One of the major key selling points of Buhari is that he naturally appeals to the masses, to people in the grassroots. When I have conversation with people in Abuja, I used to tell them that let me take you to some of the strongholds of Buhari’s states like Kano, Katsina, Jigawa, Sokoto, Kebbi, Zamfara, Kaduna, Bauchi, Gombe, Yobe, Borno, Adamawa; you need to see how the people at the grassroots love Buhari, it is an unconditional love. It will scare you, it is an unconditional love over their conviction that Buhari is a man of integrity. Buhari has not been dented, no stain on his body and that is counting for him. It will look likely that the South-West looks more prepared to give more vote so that they can be able to stand stronger in the quest to take it over. The South-East is also coming stronger. I was having a conversation with some of our South-Eastern friends and they said ‘if we want to come out and grab this presidency, one of the shortcuts to it is to be able to support the Buhari presidency, then you prepare yourself and go for it’. So the zoning itself is very very important. To the younger generation, they are also beginning to realise that a Buhari second term is the easiest way that we can have a generational shift. We’ve been talking about generational shift and now we have signed the ‘Not Too Young To Run’ into law, but I tell you for some of us who don’t have the ‘Not Too Young To Run’ and we have to work so hard to break into the system at a very young age, I am telling you that it doesn’t look likely that they are going to leave the stage. The easiest way is Buhari. When Buhari gets a second term, it goes to the Southern part of the country. It will spend an average of eight to 12 years and if you ask me, I want it to spend 12 years in the Southern part of the country. I don’t consider myself as a young man but believe me, I am ready to join the Buhari, I don’t want to mention names, but let me also say the Aminu Tambuwal, Rabiu Kwankwaso, Abdullahi Ganduje, Abubakar Atiku, all of them. I am ready that my own generation should join them and go because younger people are coming. Now the point is that by the time it spends some eight to 12 years in the South and it comes to the North, naturally this particular generation is gone. Some of them might still be in their early 60s, but the point is that those people who are 30 today, who are in their late 20s and mid 30s will be the ones who will be senators, the ones in the House of Representatives, they will be the ones who are governors, and they will stand a better chance of aspiring to become president of the country. Now, if after the four years it goes to the Southern part of the country, you could still have the generation of Yemi Osinbajo and the rest tussling to become the president; give them one term when it comes to the North before it goes back to the Southern part of the country, that generation is gone. A second term for Buhari; this country will have a new generation of leaders in the next 10 to 15 years and you know the interesting thing? A lot of young people are beginning to realise this and that is what is being discussed in every corner you go. This is going to work very very well for Buhari. So the next election is simply a battle between the elites and the masses. The elites and the masses, you mean you versus the masses because you are not part of the masses? Some part of the elites (Jibrin laughs), thank you for drawing my attention to that. The point I’m trying to make is that some group of the elites who are determined to see that Buhari does not win. So it’s going to be a battle between some of these elites that are enemies of the country, as against the people, the citizens of Nigeria. On the planks on which the President campaigned – security, economy and anti-corruption war; what has happened on those three platforms that make you think that Nigerians should vote for him again next year? I tell you this, President Buhari and the APC government have done excellently well if you ask me, indeed, in these three key areas – security, economy and anti-corruption. When you take the economy; when people say the economy has gone bad, I asked them ‘how do you measure an economy that you can say it’s a success?’ Now when you talked about the items, the commodities, all of that falls under inflation. Are you aware in the last 18 months that inflation has fallen from 18.7% to 12.5% as of today?